We’re excited to announce the release of Gila Man, the brilliant new album by American instrumental soundscaper Todd Tobias. The album is available now on CD via Tiny Room Records (Europe/UK/Australia) and via Todd Tobias (USA) and digital formats via BandCamp as well as the usual digital outlets. Read more on the album below and listen to further Todd Tobias releases here. 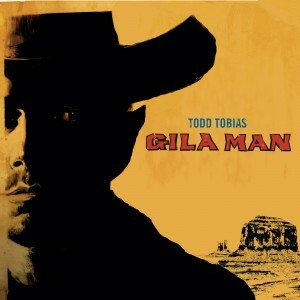 Each Todd Tobias solo album presents its own discrete, surreal world – and Gila Man is no exception. A wordless musical novella that merges a psychedelic Western with shadowy science fiction, Gila Man simultaneously evokes the wide-eyed wonder of discovery and the creeping dread of what horrors may lurk around the next corner. Featuring the stunning wordless vocals of English songwriter and fellow Hidden Shoal artist Chloë March, the album is at once beautiful and unsettling – and a wonderful distillation of the magical qualities of Tobias’s previous musical outings. Gila Man’s individual songs vividly evoke characters and scenes within the album’s imaginary narrative, casting dusty projections onto the mind’s eye. Breezily meditative single ‘Pollen Path’ shimmers with acoustic fingerpicking and Chloë March’s celestial voice. ‘Howler’s Hill’ breaks out of its haunted intro into an agitated, fuzzy churn, while ‘Queen Mab’ circles around synth and chime motifs to create a delicate, melancholic dirge. ‘Tularosa’, again featuring Chloë March, is woozy, French-sounding atmos-pop. ‘Highlake’s Last Stand’ pits dreamy guitar wanderings against ritualistic sludge rock. Wherever this music ventures, the listener is compelled to follow.